Sonny Ardmore is an excellent liar. She lies about her dad being in prison. She lies about her mom kicking her out. And she lies about sneaking into her best friend's house every night because she has nowhere else to go. Amy Rush might be the only person Sonny shares everything with -- secrets, clothes, even a nemesis named Ryder Cross. Ryder's the new kid at Hamilton High and everything Sonny and Amy can't stand -- a prep-school snob. But Ryder has a weakness: Amy. So when Ryder emails Amy asking her out, the friends see it as a prank opportunity not to be missed. But without meaning to, Sonny ends up talking to Ryder all night online. And to her horror, she realizes that she might actually like him. Only there's one small catch: he thinks he's been talking to Amy. So Sonny comes up with an elaborate scheme to help Ryder realize that she's the girl he's really wanted all along. Can Sonny lie her way to the truth, or will all her lies end up costing her both Ryder and Amy? Kody Keplinger grew up in a small Kentucky town. During her senior year of high school she wrote her debut novel, The DUFF, which is a New York Times bestseller, a USA Today bestseller, a YALSA Top Ten Quick Pick for Reluctant Readers, and a Romantic Times Top Pick. It has since been adapted into a major motion picture. 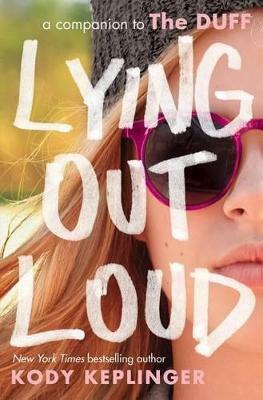 Kody is also the author of Lying Out Loud, a companion to The DUFF; Run; Shut Out; and A Midsummer's Nightmare, as well as the middle-grade novel The Swift Boys & Me. Kody currently lives in New York City and writes full-time. You can visit her online at www.kodykeplinger.com.